C'YaPass: Forget All Your Passwords | A Password Generator? What? Why? How? ← Why Did I Create C'YaPass? Who Will Use It? A Password Generator? What? Why? How? Here's the thing that may seem odd. CYaPass does not store your password anywhere. It generates your password every time. When you see a really new thing, it doesn't quite look right. I mean somebody probably would've already thought of this thing, right? That's one of the reasons I'm so excited about CYa Pass, because it forces a paradigm shift of sorts. Previously, everyone thought that you had to store the password in a file and keep it encrypted for the user. Now, CYaPass changes that. It does something so different that it shifts your thinking about passwords. The act of creation is singular, as is the moment of creation, and the result is something fresh and strange. How Can CYaPass Generate the Same Password Every Time? 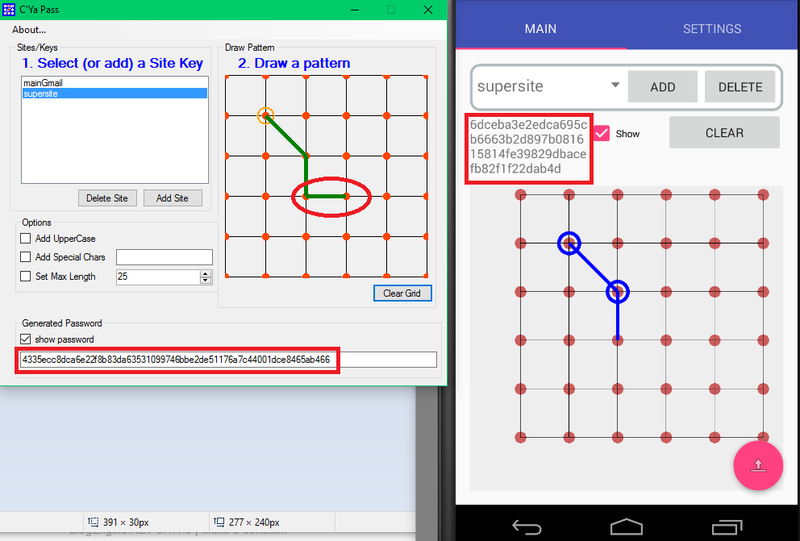 As long as you have the same value for your site/key and you draw the same pattern it doesn't matter if you're running the Android version or the Windows version, it will generate the same hash value password for you. Here's the Android version running next to the Windows version. You can see that when they both have the same site/key and pattern then the password hash is exactly the same. It's not stored anywhere. It's generated from those two data elements. If you alter the site/key at all the generated password is altered, because it is generated off of new data. 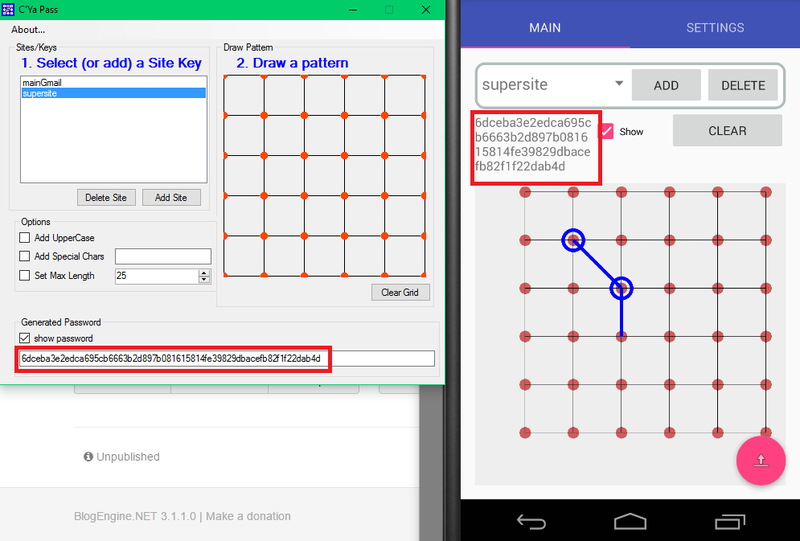 In the next image you can see that I change the site/key from supersite to supersite1. Even one character change alters the resulting password in a large way. Of course if you change, just the pattern at all as I do in the next image you will see that even if the site/key has not changed, then the password is altered drastically also. 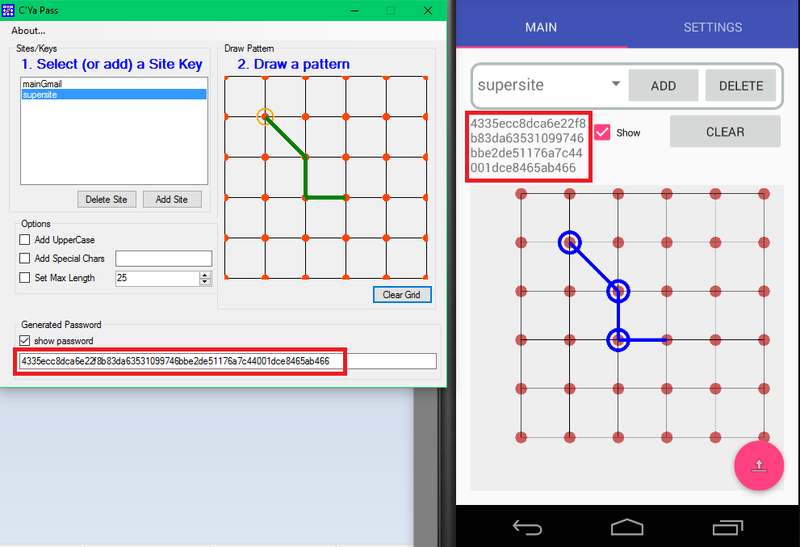 Notice that I both the Windows and Android apps are using the same site/key but I altered the pattern only on the Windows app, which alters that password. Finally, I change the pattern on the Android app and that makes the passwords match again -- though they are, of course, different from the original ones since the pattern changed. You can clearly see that these passwords are generated though they are not stored anywhere. That's why you can generate the same values on two different systems even though they have no knowledge of each other. That means as long as you know your site/keys and pattern you can re-generate your password on separate platforms so you can sign in from any device where you have the C'YaPass app.